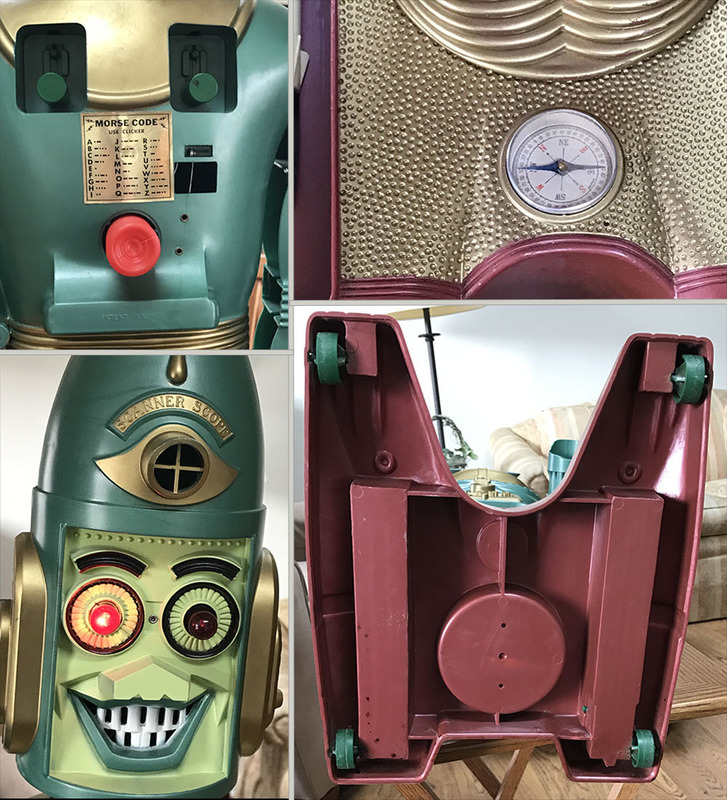 We are proud to showcase this mint condition Robot example and his mint box. We just don’t see surviving Robots in this condition so it’s a rare treat to find one like this one. He eventually was re-homed to a very nice man in Virginia. Come back with me now to a very special morning in 1963 at Madison Maine with a nine-year-old little boy named Lee. He awoke to a gigantic present near the Christmas Tree. Excited thoughts immediately raced through his head, could this be what he had been nagging his family about for over 4 weeks? He had been watching a commercial on TV about a Moon Robot that he absolutely had to have. Could this, be it? Although the wrapping paper was quickly torn off, once the yellow box started to appear he somehow knew he had to be more careful. Yes, it was the Big Loo that he had been praying for and he wanted the box to be treated as importantly as the Robot itself. Unlike most boys his age, his first instinct WAS NOT to rip off the flaps from the top of the giant box. Instead, he very carefully pried the large copper staples that held the top together. So carefully in fact, the only marks left on the top of the box today are the tiny holes that the staples once held the top shut. Unbeknownst to Lee, his box had already survived a long journey. 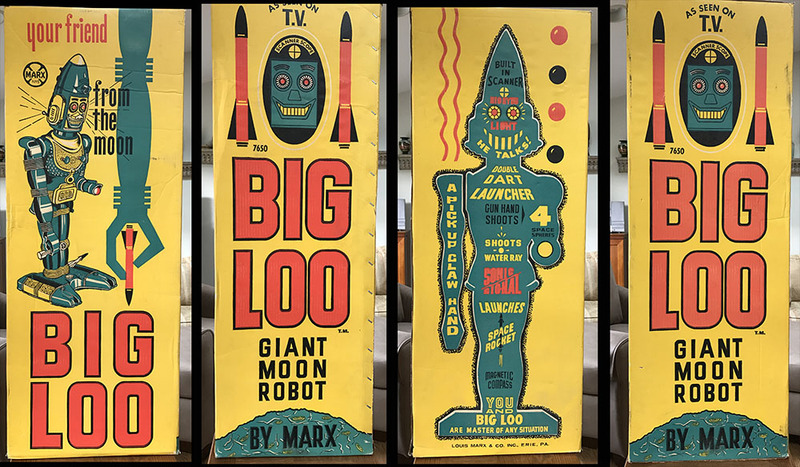 This Big Loo had left the Marx factory located in Erie Pennsylvania on October 21, 1963. We know that because the date is stamped on the bottom of the box. The destination was the Sears, Roebuck and Co. Warehouse located at 201 Brookline Ave. in Boston, Mass. Again, the bottom of the box is complete with this historic information. Lee’s generous grandparents had seen the Big Loo advertisement in the Sears Catalog and once the order was received, the first leg of the journey started. 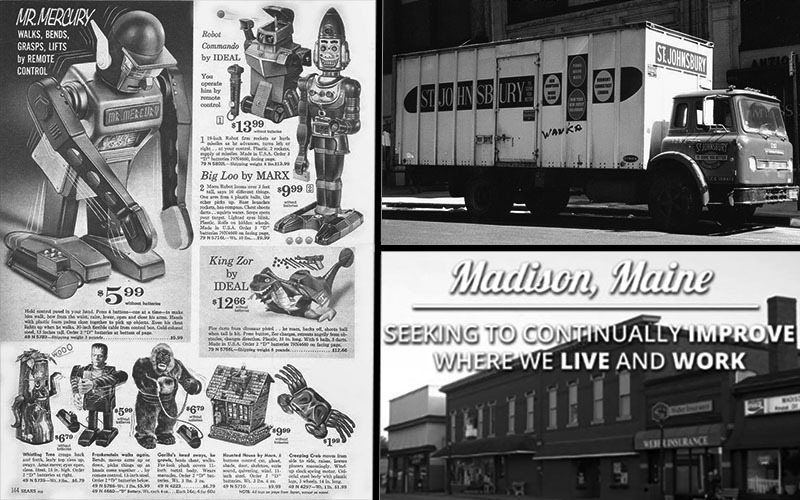 The giant box was placed inside a transport truck with the St. Johnsbury Trucking Co (still in business today) and finally arrived at the family home on Houghtson St. in Madison, Maine. All this information is contained on the bottom of the box which significantly adds to its provenance. Below is the original Sears Ad, the shipping truck used and the city destination. As Lee carefully lifted his new Robot from the safety of the box, the package was carefully set aside as his family believed in storing important items in their original box. This was vastly different from the majority of American households where the colorful Big Loo box was set on the curb by the thousands to be picked up by the local garbage truck. Not only was this special box saved, it was treated like a fine piece of furniture. Lee played with his Big Loo, but just as his family had taught him, he did so in the most loving and careful manner. In fact, the Robot shows such minimal play wear that it appears that Lee spent most of the time just admiring the Robot instead abusing it as so many nine-years-olds did. When it came time to put away his Robot away, it was tenderly returned to its giant box where it remained for the next 53 years. Time marched on and Lee grew into an adult with only occasionally thinking about that extra special Christmas and his 3-foot-tall Big Loo. When Lee’s parents passed, he had the unpleasant task of liquidating their estate. He returned to the Madison family home and one by one, the liquidation tasks were completed. The last item on his list was to clear out the attic. As he slowly opened the attic door and switched on the light, he was surprised to see a familiar sight in the far corner. It was a bright yellow box and his mind was immediately transported back to that wonderful Christmas in 1963. Lee assumed that although his parents had saved the box, it couldn’t possibly have the Robot inside. Or could it? He lifted the top flaps just as he had first done in 1963 and sure enough, Big Loo had been patiently waiting all those years to see the light of day once again. 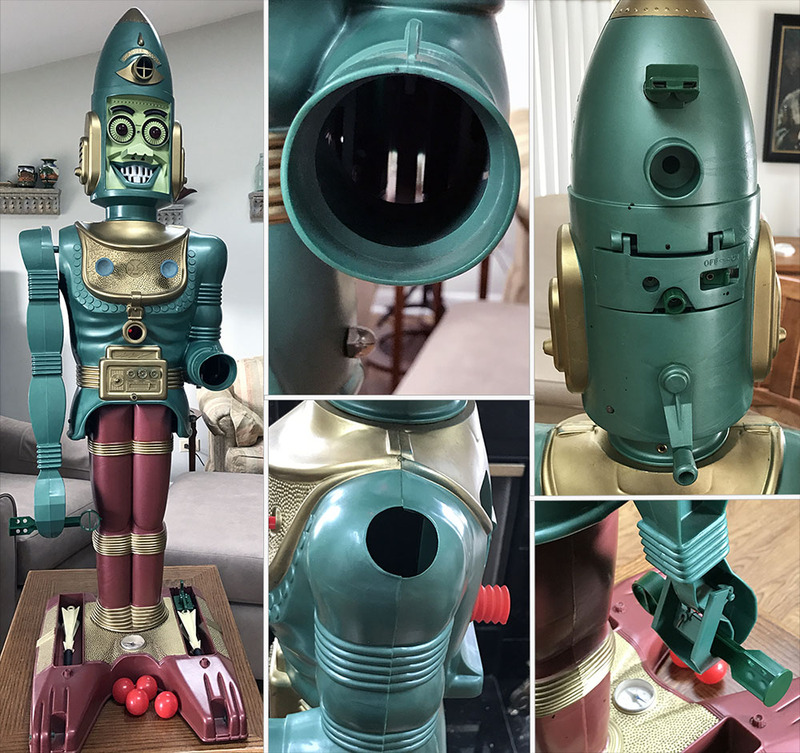 This Robot may be early in the Marx’s production run due to all the accessories, knobs and switches are in the seldom seen dark green color. This is the only Big Loo that I have seen to date, that ALL the accessories are molded in this color! They include the Space Rocket Launcher, Whistle, Dart Buttons, Eye Light Switch, Battery Door Knob, Moon Grenade as well as and the four Bottom Wheels! We often see the Moon Grenade molded in dark green but everything else is ALWAYS in the light green color. If he is not from an early production run, he certainly is in the extremely rare category with the copious dark green accessories. Another interesting color element is his pair of Space Rockets which are the Ivory/White color with back tips. The Robot’s plastic body areas maintain their original shinny luster with no scratches. His top crown, gold breast plate and accordion joints simply pop against his green body and maroon legs. The battery compartment is pristine as there is no rust whatsoever. The dark green Battery Compartment knob and Eye Light Switch adds some extra bling to the rear of the head. These knobs and switches are extremely rare in this color. The voice crank is original and of course, mint in appearance with no hairline cracks from over cranking. The back of the Robot retains the Morse Code sticker in perfect condition with no curled edges. The original red Water Ray inserts into his back portal and is ready to fill with water and fire away. The Dart Release levers and Dart knobs work as intended and again, they are both molded in the very uncommon dark green color. There is one small mark on the right Dart Knob. While we’re here, feel free to sound his Bell and tap his Clicker to send a Morse Code! The Magnetic Compass really stands out as it looks absolutely perfect. It’s interesting how the Compass can add as much as it does but because the glass is so clear and with the total absence of corrosion – it simply cries out to be looked at! The compass is surrounded by wonderful gold dimpling on Big Loo’s base and not a crack in sight. The head of Big Loo is immaculate with fully functioning blinking eyes. The main face elements including his famous smile are free of marks, wear and discoloration. Flipping the Big Loo over to examine the underside reveals no repairs and all four dark green wheels appear to have never touched anything but carpet as there are no abrasions from skidding on a hard floor. Unlike other Big Loos, this guy never had to bear the weight of child in a shortsighted attempt to be ridden, his perfect wheels can attest to that. As many of you know, this is one area on these Robots that often times have cracks and past repairs. The photo below is a favorite of mine as the rare fully functioning Whistle really adds another level of unique distinction. 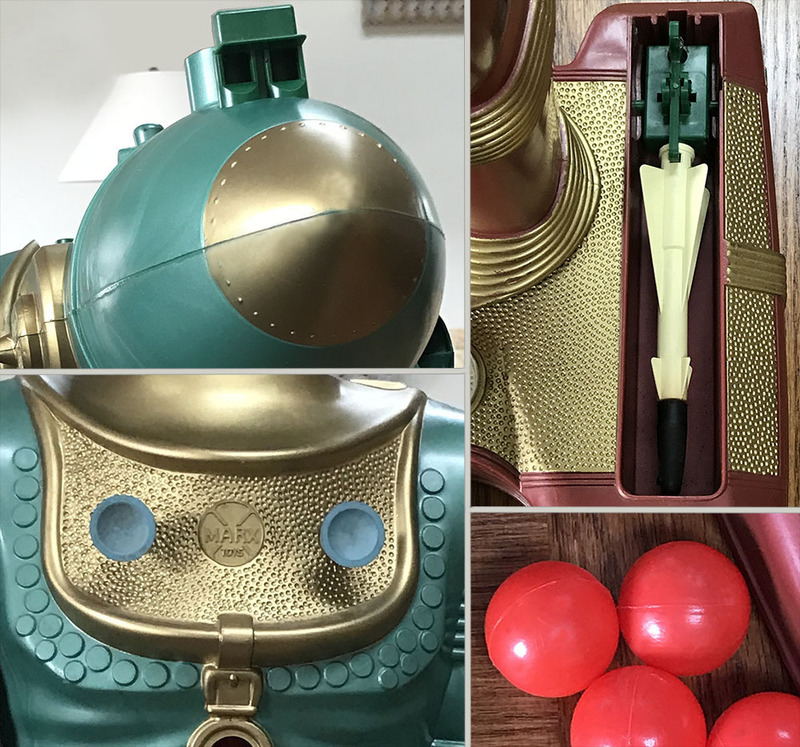 This Whistle is almost unattainable in this dark green color and when inserted into the Robot’s head, you just known that you are looking at one rare Big Loo! Turning to the bottom dual equipment bays, one contains a beautiful condition dark green Rocket Launcher whose color is seldom seen. The Robot displays his gold breast plate with pride and with a glowing shine that completely hides the fact he is 53 years old. The dimpling pattern is so dazzling that it is almost hypnotic to look at. Both twin Darts retain their flexible light blue rubber tips which are uncommonly supple. The Marx rubber products from this era almost always age very badly and become hard and/or malformed. The bright red shafts of each Dart are pristine with no cracks or fractures. Turning now to Big Loo’s mighty arms, the Pick-up Claw works as it should, ready to grab your Moon Grenade or anything else that is handy. The long wire rod that travels the distance inside the arm looks like it was made yesterday with no corrosion resulting in a very strong gripping action. The two Acorn nuts to Big Loo’s side are shinny and look brand new. The Gun Barrel Arm is still powerful and is complete with the originally issued 4 red Space Spheres. The Barrel target sight on the end of the arm is free of chips. The seams along each arm are extra tight with no parting. Now that’s how a Big Loo should look! To see this box is like stepping into a time machine and then popping out on Christmas morning in 1963. The box does not appear to have aged a single day. All the colors are still robustly vivid and bright. The Marx Toy Co. sure got it right when they designed this fun looking box! Comparing Big Loo box images found on internet searches, this one appears to be one of the best survivors to date. Some others have tape marks and others have ripped or missing panels. This one has neither of those issues. 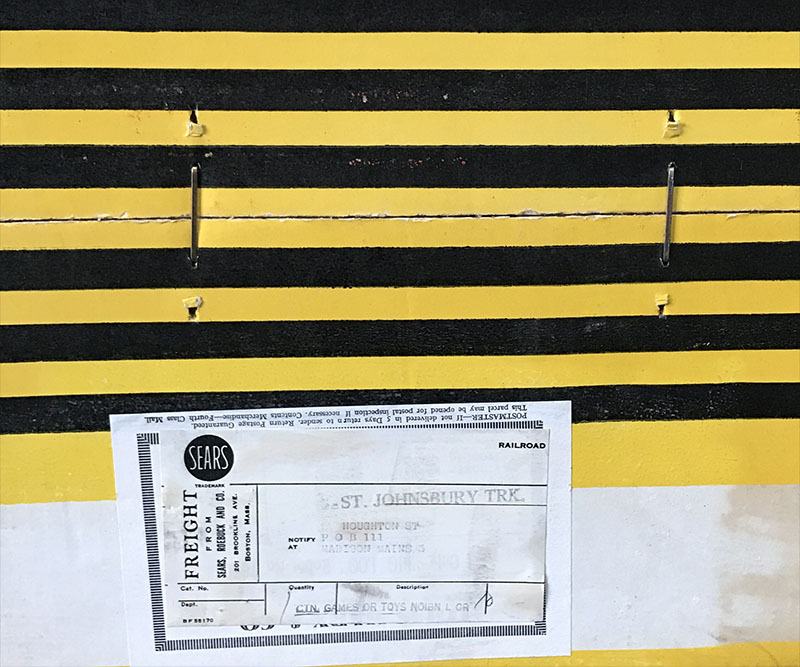 Many have large marker pen notes used by the shipping company, this box has virgin panels. We also note that most boxes have dents, punchers and creases in the middle or along the sides. This box in pristine. I don’t know how the trucking company did it in 1963, but they must have been wearing white gloves and padded it with pillows during the ride. How else does a box like this survive in this condition? The shipping label as mentioned above, adds tremendous provenance to this Big Loo. Normally, the box would ship from the Marx Toy Co. factory with only their label and be delivered to the many toy stores for resale. In this case, Sears bought this product in bulk and advertised it in their famous 1963 Toy Catalog (some say the best toy catalog ever published). Sears then placed their label over the existing Marx factory label and distributed it through their mail order catalog. You can still see the edges of the original Marx label under the Sears Roebuck & Co label. The ship date, Sears Warehouse location, Trucking Company used to deliver to Lee’s parents as well as their street address from 1963 are all still clearly visible and adds a touchstone that is hard to describe. Like buying a vintage Corvette, you get extra points if it still has the build sheet on the gas tank. Looking at this Big Loo in that way – the rarity of this Robot speaks for itself. We know where it came from, on what date and the owners name that would keep it for the next 53 years, until now. I got Big Loo for Christmas when I was 10,and willneve forget how excited I was.i also remember where my dad got it! Two guys in Hackensack New Jersey.sumwhere I have a photo standing next to him Christmas Day. I could cry about how I miss childhood times like lt.warm wonderful times,thanks to my mom and dad. Thanks for the memories. I still have mine but it is definitely used. Sitting in a storage shed now along with a thimble city game and gi joe and misc items.